The Achilles tendon is tremendously strong, connecting the muscles in the lower legs with those in the heel, thus enabling walking and running. Without the ability of this tendon to deal with massive pressure, sometimes several times the weight of the body, humans will not be able to walk, run or jump. When the tendon becomes inflamed and irritated, Achilles tendonitis can develop, causing sufferers a great deal of discomfort and foot pain. How Does the Condition Come About? Many people that partake in vigorous sports activities fail to stretch their muscles prior to taxing physical activities, and therefore place the tendon under an unacceptable amount of pressure. Sports that require a lot of jumping, such as basketball for example, are one of the most common causes of the condition with younger people. Inflammation that leads to this condition can quickly develop in cases of physical injury to the ankle, calf or lower leg. Sometimes new bone grows at the base of the heel and this growth may prove to be an irritant to the tendon, eventually leading to Achilles tendonitis in older people. What are the Main Indicators of the Condition? One of the surest indicators of Achilles tendonitis is severe foot pain or pain behind the heel. The pain is not always acute, but almost all patients experience increased levels of pain when the muscles of the ankle, calf and foot have not been in use for some time. Most patients report tenderness and swelling in the area of the tendon, and jumping or pushing often result in sever, sudden pain. Standing on the toes is often excruciating. There are several treatment options for Achilles tendonitis, ranging from shoe insoles to drastic surgical interventions. Rest is regarded as one of the most important treatment, and often specialists will go as far as to immobilize the foot to make sure that all the muscles rest. Lifting the heel by means of special shoe insoles can also help to relieve the pressure on the tendon. Ice packs that is often applied to the affected area helps to improve the blood flow, and this contributes to relieve the foot pain somewhat. Anti-inflammatory medication can contribute towards bringing the infection under control, and shoe insoles may also help to lessen the pain. Physical therapy forms an important part of any treatment program, and patients have to build the strength and suppleness of their muscles with a specially designed exercise regime. Surgery is not readily undertaken, and most foot specialists prefer to first exhaust all other options. Most surgical procedures that aim to treat Achilles tendonitis concentrate upon the removal of a part of the tendon and subsequent lengthening of the remaining part. Can One Do Something to Prevent it? Most sportsmen know how important it is to avoid foot pain by completing a series of stretching and warming up exercises before they subject their bodies to the rigors of exercise. Strong muscles and tendons that are kept flexible with regular aerobic exercises are less likely to be injured. A heel spur is a bony development in most cases encountered in the heel structure or calcaneus area. The heel bone (calcaneus) would be the bigger bone in the foot and plays a substantial factor in taking jolts and strain as we talk a walk. It might probably cause strong heel pain whenever strolling, standing upright or possibly due to a sudden motion such as jumping. When ever you position your weight on the heel, the pain with a heel spur are often devastating. How Might a Heel Spur Manifest? The actual plantar ligament is a fibre strap that performs as an effective support platform in your foot arch. It goes through the heel towards ball-of-the-foot place. When foot direction is weak, the muscle all too often pulls where it hooks up to the heel structure causing very fine-tears. When ever this occurs, calcium stores appear and bring about a nail-like swelling. They build from the calcaneus and force in the direction of the fleshy spot on the feet. Men and women which have high arches or flat feet tend to be more predisposed to getting heel spurs. It's because of the overpronation or oversupination which commonly arises because of the mediocre biomechanical form the foot often have with this type of situations. A lot of women may perhaps be much more likely than adult men to formulate a heel spur thanks to her selection of high heel shoes. Provisional remedies for relief of pain from heel spurs may include lifting the foot, relaxation time and working with an ice pack to diminish inflammation of the joints. All of these procedures however are no more than non-permanent and really do not provide you with a prolonged answer to the problem.However, if flat feet or high arches have proven to be bringing about the formation of a heel spur a doctor can propose heel pads or heel cups which may aid to distribute your mass a bit more consistently during impact and will support your actual heel which might help eliminate the pain and discomfort you may be having to deal with. Heel cups or pads can certainly be included on supports insoles (arch supports) to take the stress clear of the main problem zone at the same time. With respect to supplemental assistance, heel pads or heel cups may well be chosen. Your health care provider can encourage decreasing any extra weight you could be shipping and even looking for good boots and shoes. When you are on the lookout for shoes, be sure that you find a pair with a cushioned sole to further withstand shock, yet is strong just enough for being supportive and enable foot alignment restraint. In the instance that such systems fail to offer you pain alleviation, an injection of steroids can really help diminish the joint inflammation of the plantar fascia, or alternatively a surgical procedure to remove it is quite often practiced. All the same, a number of obstacles may well materialize following these options, accordingly they've been utilized as a form of final option. A little more non-surgical means like for example heel pads or heel cups can be the treatments usually chosen. A recent process which is usually advantageous is described as extracorporeal shock wave therapy (ESWT). It causes minuscule shock towards the damaged tissues surrounding the problem site. This will be applied looking to arouse a muscle tissue replacement process in the human body's organic defenses. By way of the more intrusive kinds of heel spur cure such as an operation, injections, or ESWT it will be critical that any sort of biomechanical conditions that would stimulate the heel spur to come back are cured by means of heel pads or heel cups. There has been a huge increase in the number of people calling on the health service over the past few decades in the uk, among the many complaints one stands out head and shoulders above the rest. Foot pain is the most common complaint faced by the population of the uk. Heel pain comes a very, very close second to foot pain. Pod iatric and chiropractic professionals have become inundated with individuals suffering from heel pain and in the constant fight to alleviate or eradicate the conditions many foot doctors have turned to foot orthotics to combat heel pain. Heel pads are probably pediatricians most favoured treatment for heel pain. Soft pliant shoe inserts that surround the heel area and protect against numerous ailments such as, heel spur, joints or the muscles and tendons around the ankle joint, osteoarthritis,inflammatory arthritis, plantar fasciitis or enthesopathy and many, many more. As the number of patients increase so does the prescribing of heel pads. 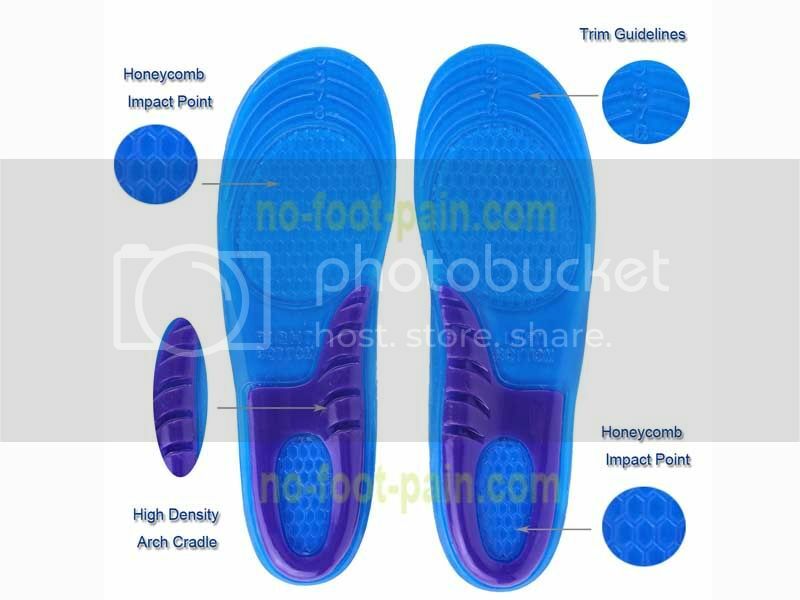 These innovative and increasingly more popular shoe inserts have kick started a huge industry in the production and marketing of heel pads, so much so that they are now widely available in local stores, doctor's waiting rooms and of course on the internet. Heel Pads work by shielding a sensitive or injured heel from the effects of everyday life. Encasing the heel area in a, normally silicone gel constructed cocoon, they offer protection from the shock and stresses that the foot endures during walking, jumping and any serious impact. Unprotected by the safety of these heel pads the foot is under extreme stress and can easily become damaged. Poor footwear choices can also put the feet under considerable strain but even these dangers are countered by the use of quality heel pads. A s you depend on your feet so much, it makes perfect sense to protect them, you do not even need to seek medical advice, though this too makes sense. As with most things in life, as demand increases so does the supply, there are numerous types, designs and specialist fittings to consider. If you suffer a serious medical complaint, you are advised to talk to your doctor or local podiatrist or chiropractor. If your symptoms are not too severe or you just want to pamper your well used feet, you can safely buy heel lifts without professional assistance. The cheapest heel pads are to be found on the internet. As with most things these days, the medical profession seems determined to increase profits and the products they supply have increase immeasurably in cost but there is no difference in quality from those so readily available from the internet. When you are prescribed a heel pad by a doctor you are going to pay for his knowledge and training, when you purchase yourself, you pay for what you get and that is a considerable saving of money. Although a few foot pain issues require professional medical attention, and it is only a few cases, most heel related problems, as those mentioned above can be alleviated a lot more conveniently and far less expensively by sitting at your computer and ordering yourself a quality low cost pair of heel pads.